Updated Tuesday April 2, 2019 by Foothill Hoops. Registration NOW OPEN! Click Here to REGISTER NOW! Welcome to the Summer League general information page. Assessment days are coming up in May! Specific practice and game schedules will be published online in June. Players ages 3-5 need not attend an assessment. Our Summer League is open to boys and girls ages 3-15; we have no "zip code" requirements or priorities. We are a non-profit, 501(c)3 federally recognized youth basketball organization with players from La Canada, La Crescenta, Glendale, Pasadena, Sunland, Tujunga, Burbank, Eagle Rock and Los Angeles. We are based primarily in the Crescenta-Canada area, utilizing gyms in La Canada, La Crescenta, Glendale, and Pasadena. Teams will practice once a week on a weeknight and games are played on the weekends. All practices and games will be held in La Canada, La Crescenta, Glendale, or Pasadena. Practices are once a week, on weekday evenings (after 4:00 pm). 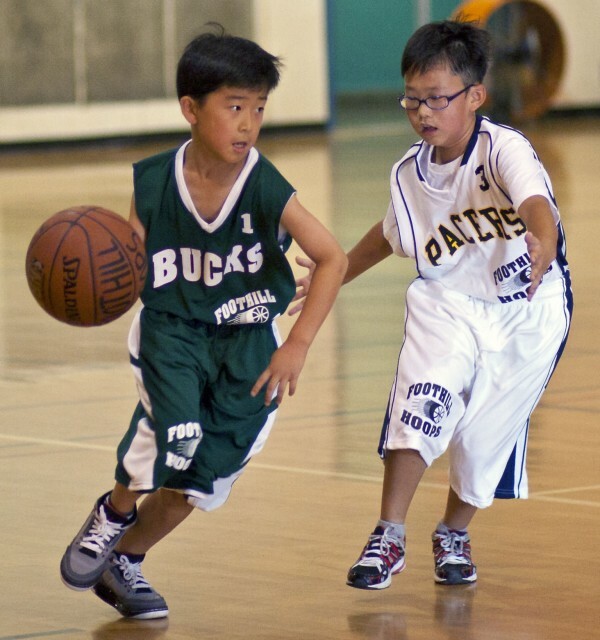 Younger players tend to practice at the earlier times. Players ages 12-15 may practice as late as 9:00 pm. Games are on Saturdays with some Sundays games based on gym availability. Events on Saturdays are usually between 9am-9pm (younger ages play at earlier times). Events held on Sundays are always after 12:00. If there is a day of the week your player is unavailable for practice, please let us know by filling out a Request Form at one of the Player Assessment Days. Practices and games during the summer are typically held at Rosemont Middle School in La Crescenta or at the FIS gym in La Canada. Foothill Hoops is grateful to our volunteers who coach our ages 6-15 teams. Moms, dads, aunts, uncles, grandparents, friends, and older siblings are all welcome and may volunteer as either a head-coach or as an assistant. Anyone who coaches will go through background check, a mandatory coaches’ training, and FHB staff assistance and support will be provided throughout the season. Foothill Hoops staff coaches all Rookies (age 3), Dribblers (ages 4-5), and Ballers (age 5) teams. There are no try-outs in the traditional sense for the Summer League as everyone is guaranteed to make a team. There will be, however, two Player Assessment Days for each season. These assessments are necessary to create balanced teams within each division. Players only need to attend one assessment day. We also consider height, age, and years experience when putting together the teams. Even if your son or daughter has played with us before, attendance at one of these days is critical because players grow and develop from year to year and so that we may evaluate your player up against the current player pool for their division. Please note: if your son or daughter registers for the league and is unable to attend an assessment, he or she will still be placed on a team with the understanding that his or her team assignment may be subject to change if we see that the teams are uneven after the start of play. Our neutral Foothill Hoops staff does all of the evaluating at the Player Assessment Days. We do not have parent volunteers evaluate, nor do they draft the teams. Instead, our staff performs a "blind draft" of the players after the assessments using their assessment scores, ages, and heights as considerartions for forming the teams as evenly as possible. Players registering for the program are not signing up to be placed on a specific team (nor with a specific coach). Rather, they are signing up for the league in general and may be placed on any team at the discretion of the Foothill Hoops staff with the goal of team balance and equal skill/experience distribution. The only requests that will be honored are those that are done IN PERSON at our Player Assessment Days. These players must then attend an assessment. We do not accept any requests via phone, email or in the online registration process. At the Player Assessment Day, please fill-out a request form. Filling out a form is not a contract or a promise that the request will happen. The registration fee for our regular seasons is $199. This includes all costs for the 8 week season, and no additional fees will collected. Your uniform cost is included in this price, and uniforms for the younger divisions are yours to keep after the season is over (divisions 10u and up must return their uniforms after the season in exchange for a gift bag). Every player also receives an end-of-the-season trophy, award, or gift pack. Pictures are additional and are available for purchase on the designated Picture Day during the season. We offer financial aid and payment plan options for those who cannot afford the registration fee. Please email info@foothillhoops.org with financial aid questions. Registration can be completed online starting April 1 through the day before the second Player Assessment Day. Registrations are also taken in person at the Player Assessment Days for each season, but please try not to wait to register in person as spots may fill and you may be placed on a waiting list. If for some reason you need to cancel your registration or would like a refund, requests must be sent to our League Manager in an email: paul@foothillhoops.org. There is a $25 drop fee on all cancellations, and no refunds can be given after two weeks of the start of practices. Any cancellations after the start of the season, and within the 2 week period, will be subject to the $25 drop fee, plus any pro-rated charged corresponding to the length of the season. Any credit card convenience fees paid online will not be refunded. We can also offer a credit for an upcoming program instead of a refund. We hope to see you in the gym this summer!